I have been waiting an entire year to write this blog! Yes, a whole year! So please forgive my hazy memory (a sensible person would have written this a year ago and saved it! ), but I just had to share the Jesmond Dene House Festive Afternoon Tea with you. Simon and I enjoyed the Jesmond Dene House Christmas Afternoon Tea last December for his birthday which, rather annoyingly, falls only a few days before Christmas. By the time we were enjoying this I'd signed off from blogging for the year, I didn't even have my proper camera with me! But it ended up being the picture perfect treat and I knew I had to share it with you all. 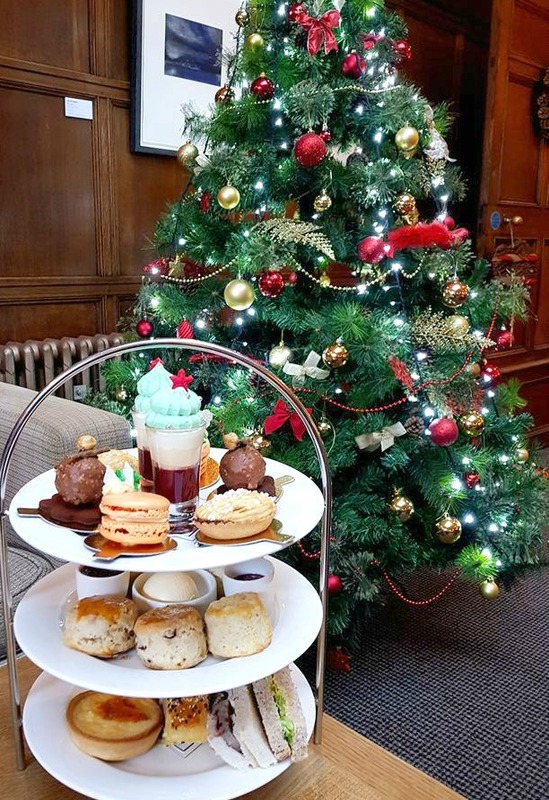 If you want to truly indulge this Christmas and still have some space in your diary I highly recommend booking yourself the Festive Afternoon Tea at Jesmond Dene House, it's the most idyllic way to give you that warm Christmas feeling and putting your feet up after a hectic few weeks of present shopping and rushing about is a must. If you're having Festive Afternoon Tea at Jesmond Dene House this Christmas then try and grab yourself a comfy seat by the fire, nothing beats an afternoon of eating cakes with the nice warm flames keeping your fingers and toes nice and toasty. The beautifully decorated mantlepiece is picture perfect and as we tucked into our sandwiches and cakes I did half expect Santa to suddenly drop down the chimney. Of course sharing all of these scrummy photographs from last year's Festive Afternoon Tea isn't very helpful is it? So I thought I'd let you have a little look at what's on offer this year, personally I think it looks even better! The savoury tier has been given a festive twist with Roast Butternut Squash and Goats Cheese Quiche sitting alongside a Sage & Onion Sausage Roll and two Christmas inspired sandwiches - Cheese Savoury on Wholemeal Bread and Turkey, Stuffing and Cranberry on White Bread. The scones at Jesmond Dene House are out of this world so you'll definitely need to make sure you leave room for them as you get three - the two classics, plain and cheese alongside a cranberry & citrus especially for Christmas. The top tier is crammed full of Christmas goodies with a Spiced Pumpkin and White Chocolate macaron, Cranberry, Cherry & Baileys Trifle, Praline & Chocolate Truffle and, of course, the Festive must have a Sweet Mince Pie. Unfortunately our overly crazy diary means that we haven't got time to indulge in the Jesmond Dene House Christmas Afternoon Tea this year. I'm absolutely gutted because that Spiced Pumpkin and White Chocolate Macaron has my name on it! So I'm really hoping that one of you lovely lot get there so you can report back and let me know what I've missed! Christmas Afternoon Tea at Jesmond Dene House is served daily in December (excluding Christmas Day and Boxing Day) between 12:00 pm and 5:00 pm and costs £25.00 per person. Pre booking is essential!